If you’re like most people, then you don’t observe Lent. According to a Lifeway Research survey, only one in four Americans does. Catholics (61%) are the most observant, while only one in five Protestants does anything special for Lent. Formalized by the First Council of Nicea in 325 A.D., Lent is defined as a 40-day period before Easter traditionally marked by fasting, or giving up something, in honor of Jesus’s 40-day fast in the wilderness before he began his public ministry. In the early centuries, only one meal a day was allowed during Lent, and meat, fish, eggs, and butter were forbidden. Today, few observers fast during Lent, although many Catholics refrain from meat on Fridays. Many of the things that people give up for Lent are things that they resolved to give up two months earlier, when they were making their New Year’s resolutions. Perhaps that’s because, by the start of Lent, most people already have faltered in their attempts to keep their resolutions. Most people who make New Year’s resolutions fail to keep them. Failures already are starting to happen this year. Health clubs that were packed in early January are not nearly so crowded now. Some of your friends who vowed to eat healthier have begun to “cheat” or have given up and reverted to their former dietary patterns. And it’s only February. Why do so many resolutions fail? A key reason is the fact that resolutions have no end date. They continue indefinitely. Changing an ingrained behavioral pattern is difficult enough without having to do it perfectly from now until the end of time. Let’s suppose that you want to lose some weight and get in better shape. You decide to do something that you haven’t done in years: exercise regularly. You compare two possible approaches, both of which involve going to the gym every other day and working out for an hour while you’re there. With option 1, you’ll do this forever. With option 2, you’ll do it for a month, evaluate your progress, and use that analysis to determine what you’ll do the following month. Which option do you choose? It’s a no-brainer, of course. But the vast majority of New Year’s resolutions are option 1. When you resolve to read your Bible more frequently during Lent, you’re choosing option 2…but for 40 days instead of a month. Forty days is a realistic time frame to keep a resolution. And when you have success during Lent, you’re more likely to do it for another 40 days. And another. And another. The first day of Lent is Ash Wednesday (for 2019: March 6); the last day of Lent is the day before Easter (for 2019: April 20). When you count those two days and all the days in between, you get 46 days. So how is Lent 40 days? Sundays in Lent don’t count. Historically, Sundays in Lent were not included as a part of the Lent fast. Call it the “Lent Loophole”. It happens. Rather than feeling like a failure and giving up, do your makeup reading, or readings, on Sunday. After Lent is over, you can evaluate your Bible reading experience during Lent and make adjustments to be more consistent after Lent. Observing Lent traditionally involves giving up a pleasure and replacing it with prayer or another spiritual discipline. Bible reading is a spiritual discipline. When you commit to reading your Bible every day during Lent, you don’t have to give up a pleasure in exchange. All that you have to give up is some time. For some of us, giving up time can seem like a sacrifice. With our busy schedules, it can be difficult to carve out 15 or 20 minutes a day for reading the Bible. Get up 15-20 minutes earlier and do your Bible reading before you do anything else. Do your Bible reading right before you fall asleep at night. Divide your 15 minutes into a few shorter segments and read your Bible instead of checking email, social media, etc. Just as Advent is a time of preparation before Christmas, Lent is a time of preparation before Easter. The focus of both preparation seasons is on Jesus and his work on earth on our behalf. Christians believe that, in Jesus, God “became flesh and dwelt among us” (John 1:14, ESV). God has revealed Himself to us through Jesus. The other main way that God has revealed Himself to us is through the Bible. The Old Testament shows us that God created us in His image, loves us, and, even though we rebelled – and continue to rebel – against Him, wants us to be reconciled to Him. The New Testament tells the story of Jesus and the early days of the Christian church and explains who Jesus was and is. 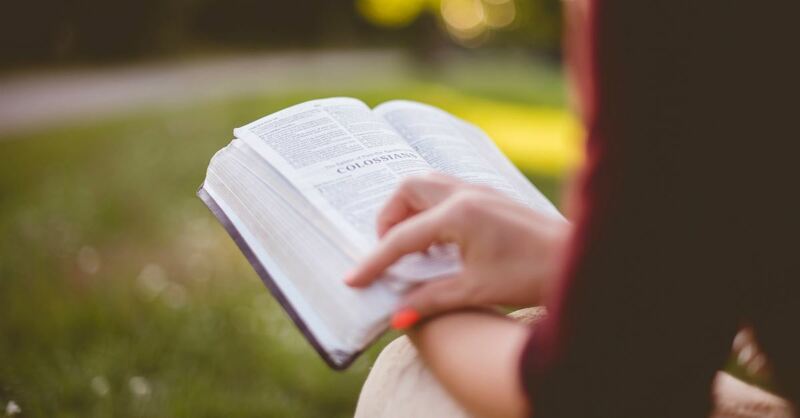 When you make a resolution to read your Bible every day during Lent, you are telling God that you want to know Him better and want to take steps on the path to being His disciple. You’ll continue taking those steps long after Lent and Easter. You’ll take them for a lifetime. Chris Bolinger is the author of Daily Strength for Men, a 365-day daily devotional from BroadStreet Publishing that is a great tool for getting into the Bible every day. The book is available at Amazon, Barnes & Noble, Christian Book Distributors, DailyStrengthForMen.com, and other retailers. For more on making the right resolution, for Lent or anytime, visit StartAResolution.us.